Marine Drive is a 3 km long avenue in South Mumbai, shaped like an inverted 'C'. 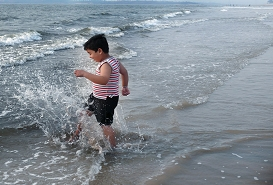 A natural bay on Arabian Sea, it has six lanes and run along the coast. But now the best way to discover the Mumbai is a stroll down Marine Drive. With its beautifully lighted promenade along the shore, Marine Drive glitters in the night giving a captivating view of the sunset over the Arabian Sea. 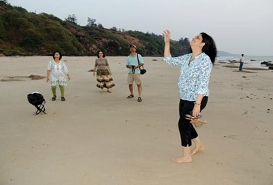 Marine Drive, built on reclaimed land in 1920, has recently added a park called Nana-Nani Park for elderly people. The Queen's Necklace, as Marine Drive is popularly known, has seen the changing of its dazzling streetlights from diamonds (white light) to gold (yellow lights). The curve of the road resembles a radiant pearl string. 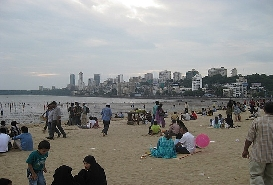 Chowpatty Beach at the northern end of Marine Drive is famous for its snacks and fast food. Besides, statues of Lokmanya Tilak and Vallabhai Patel can also be seen at Marine Drive. 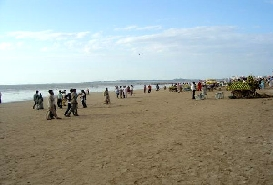 A plethora of stalls adorn the beach, selling Bhelpuri, Kulfi and Paan. There are also shooting galleries, snake charmers, monkey trainers, balloon-sellers and even masseurs.